To make this bouquet you'll need a large glass beer stein, a Collins glass, thin wood craft dowels, floral leaf ribbon and a selection of fresh fruits, veggies and flowers (listed in previous slide). Place the Collins glass inside the beer stein and fill the space between glasses with thin lime slices. With remaining limes and apples, remove produce stickers and insert the sharp end of the wood dowels at an angle into the bottom of the fruit. 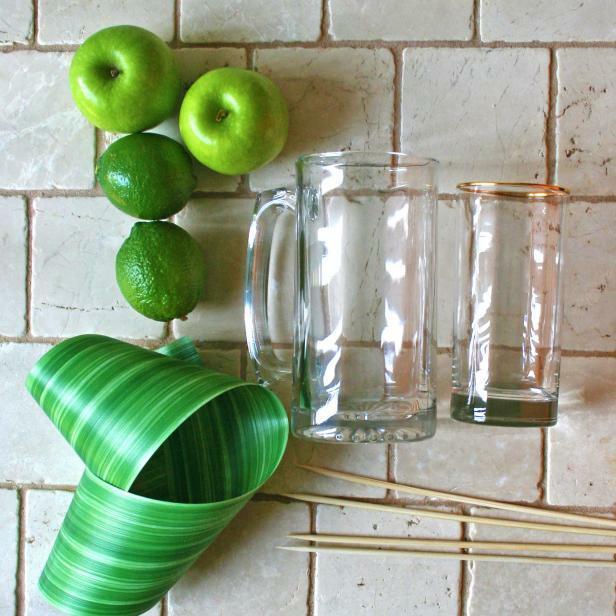 Line the Collins glass with leaf ribbon, fill with fresh water and arrange flowers and produce as desired. Tip: Cut stems at an angle and place immediately into water for long-lasting results.